On nights when there is nothing in the pantry to cook and the last thing you want to do is head to the supermarket, it is good to have a fallback dish that can be made with few ingredients that most people will have in the cupboard. This dish is simple and delicious and the ingredients can also be substituted easily – if you don’t have spring onions you can use parsley or broccoli instead, if you don’t have black olives try cubed bacon or pancetta for saltiness. Bring a large pan of salted water to the boil and cook pasta according to packet instructions. In the meantime, heat olive oil over a medium heat and add spring onions, garlic, chilli and olives and gently sautee for 3-4 minutes. 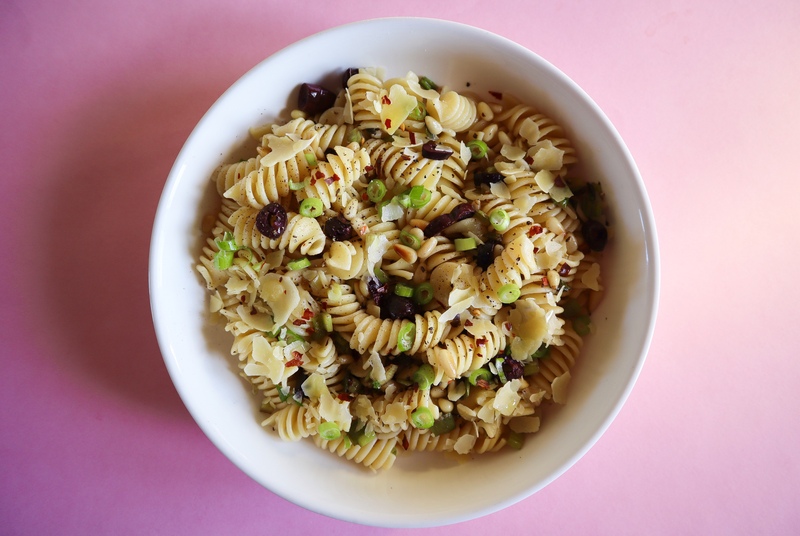 When pasta is cooked, drain and toss through spring onion mix and toasted pine nuts. Season with salt and pepper and serve topped with shaved Parmesan cheese. Enjoy! Sounds good-and all but the onions can be stored for a long time, so they are easy to keep around. Can anything with pine nuts be bad?! This sound delish!